The number of banks at risk of failing made up nearly 12 percent of all federally insured banks in the final three months of 2010, the highest level in 18 years. The Federal Deposit Insurance Corp said Wednesday that the number of banks on its confidential "problem" list rose to 884 in the October-December quarter, up from 860 in the previous quarter. Those are banks rated by examiners as having very low capital cushions against risk. Twenty-two banks have failed so far this year. And more banks are at risk, even as reported the industry's highest earnings as a group since the financial crisis hit three years ago. Only a small fraction of the 7,657 federally insured banks about 1.4 percent with assets of more than $10 billion are driving the bulk of the earnings growth. They are the largest banks, including Bank of America Corp., Citigroup Inc., JPMorgan Chase & Co. and Wells Fargo & Co. The big banks accounted for about $20.6 billion of the industry earnings of $21.7 billion in the fourth quarter. The total earnings compared with a net loss of $1.8 billion in the same quarter of 2009. The agency said bank earnings were buoyed in the latest quarter by reduced charges for soured loans. Most of the big banks have recovered with help from federal bailout money and record-low borrowing rates. On the other side, many smaller banks are struggling. Last year, 157 U.S. banks were brought down by the soured economy and mounting loan defaults. That was the most in one year since 1992, the height of the savings and loan crisis. They were mostly smaller or regional banks. The failures compare with 25 in 2008 and three in 2007. They cost the federal deposit insurance fund an estimated $21 billion in 2010. Smaller and regional banks depend heavily on making loans for commercial property and development sectors that have suffered huge losses. Companies shut down in the recession, vacating shopping malls and office buildings financed by the loans. Overall, banks' net income reached a three-year high of $87.5 billion in the October-December quarter. That contrasted with a loss of $10.6 billion in 2009. But Bair said banks need to lend more vigorously as the economy recovers. Bank industry revenue remained fairly strong through the financial crisis, FDIC Chairman Sheila Bair noted, but there is little "upward momentum." "A key reason why revenues haven't grown faster is that loans have not been growing," Bair said at a news conference. "It's not going as at fast a pace as I would like to see." The problem is partly due to continued uncertainty about the economy on the part of bankers, Bair said. But she added: "I also think that banks need to get back to the basics of making loans." Loan balances declined at a majority of U.S. banks in the October-December quarter, falling by $51.8 billion, or 0.4 percent, from the July-September quarter. A change reported Monday by Bank of America for results from its FIA Card Services subsidiary for 2009 and 2010 caused the FDIC to significantly revise its industry earnings for the three past quarters. For the January-March quarter of 2009, industry net income was revised to a $6.5 billion net loss from the previously reported $7.6 billion profit. The net loss in the April-June quarter of 2009 widened to $12.7 billion from $3.7 billion, and net income in the July-September quarter of 2010 increased to $24.7 billion from $14.5 billion. The FDIC's deposit insurance fund, which fell into the red in 2009, posted a slight improvement in the October-December quarter. 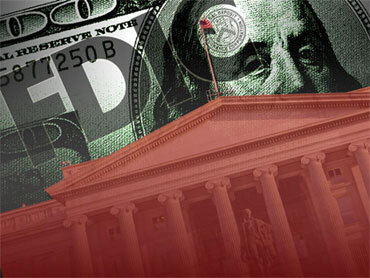 Its deficit narrowed to $7.4 billion from $8 billion in the third quarter. Bair said the agency expects the balance to turn positive this year. The spate of bank failures that began to accelerate in 2008 are expected to cost the insurance fund about $100 billion through 2013. The FDIC is backed by the government, and deposits are guaranteed up to $250,000 per account. Also, the agency still has tens of billions in loss reserves apart from the insurance fund.